NBA TV’s upcoming schedule will be highlighted by 12 live games in nine days, featuring many of the league’s top stars, including former Kia NBA MVPs LeBron James, Stephen Curry, Kevin Durant, Russell Westbrook and Dirk Nowitzki. This week’s schedule tips off with the Dallas Mavericks and Nowitzki visiting the San Antonio Spurs and LaMarcus Aldridge, tonight, Monday, Nov. 27, at 8:30 p.m. ET. Players Only, the innovative franchise with former NBA players in all commentary roles, will feature James facing his former team as the Cleveland Cavaliers host the Miami Heat and Hassan Whiteside on Tuesday, Nov. 28, at 7 p.m. The defending champion Golden State Warriors – with Curry and Durant – will visit the Los Angeles Lakers and Lonzo Ball on Wednesday, Nov. 29, at 10:30 p.m. 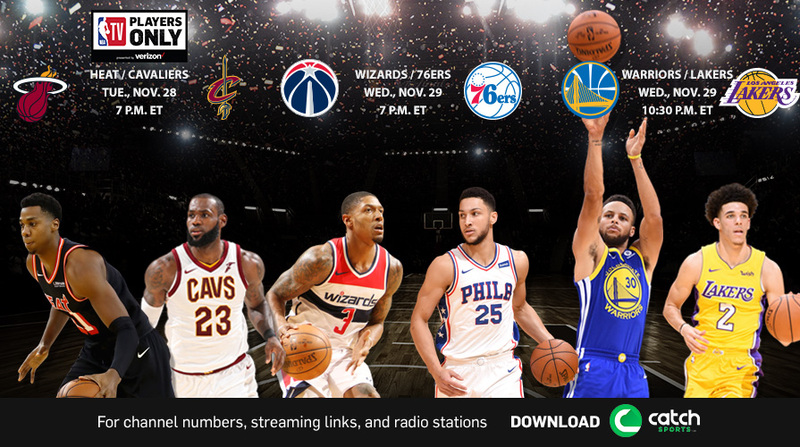 In the night’s first matchup, the Washington Wizards and Bradley Beal visit the Philadelphia 76ers and Ben Simmons at 7 p.m.
A second straight doubleheader night for the network will feature the Boston Celtics – fresh off their league season-best 16-game winning streak – and Kyrie Irving hosting the 76ers and Joel Embiid on Thursday, Nov. 30, at 7:30 p.m., followed by the Milwaukee Bucks and the league’s second-leading scorer Giannis Antetokounmpo visiting the Portland Trail Blazers and Damian Lillard at 10 p.m. The following night, the Oklahoma City Thunder – led by Westbrook, Carmelo Anthony and Paul George – will host the Minnesota Timberwolves – with Andrew Wiggins, Karl-Anthony Towns and Jimmy Butler – on Friday, Dec. 1, at 8 p.m. 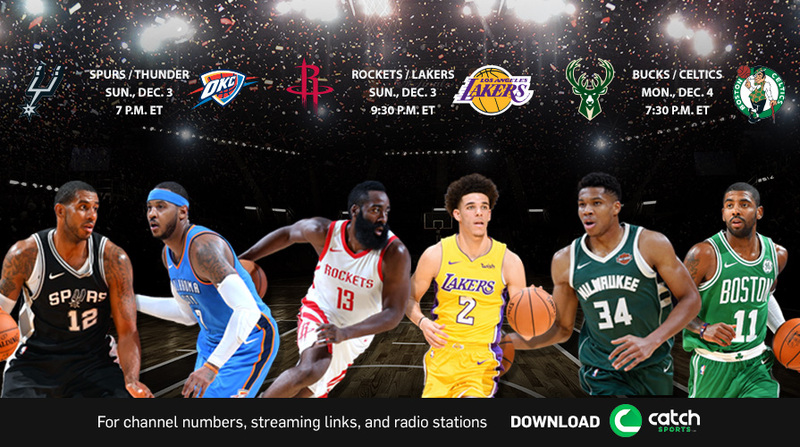 The NBA’s leading scorer – Houston's James Harden – will be in action on Sunday, Dec. 3, as the network showcases a doubleheader featuring the Spurs at Thunder at 7 p.m., followed by the Rockets at Lakers at 9:30 p.m. 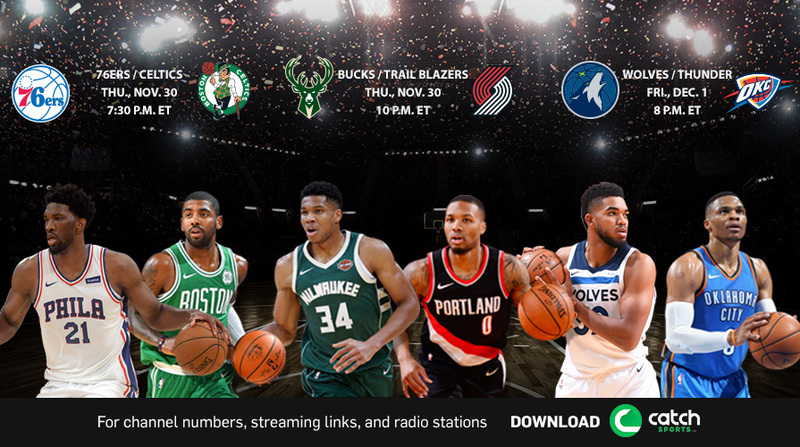 The next two nights feature the Bucks at Celtics on Monday, Dec. 4, at 7:30 p.m., followed by a Players Only doubleheader, starting with the Phoenix Suns and Devin Booker visiting the Toronto Raptors with DeMar DeRozan on Tuesday, Dec. 4, at 7:30 p.m. The night’s action will be headlined by a meeting of two talented backcourts as the Wizards and Beal visit the Trail Blazers and Lillard at 10 p.m.
• NBA TV's Three Point Revolution presented by JBL, an all-new five-part miniseries, during NBA GameTime, will continue Monday, Nov. 27, at 10:30 p.m. The series, hosted by Casey Stern, examines the growth of the three-point shot throughout the game’s history, including exclusive interviews with the players and coaches who have made it famous. The second edition will cover the transition of game planning to use the three-pointer as an asset, with subsequent vignettes airing weekly each of the next five Mondays during GameTime. 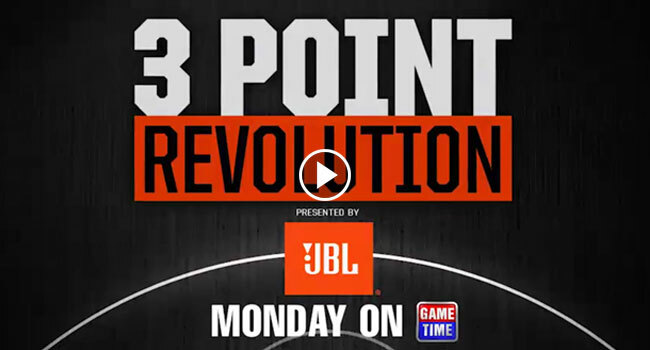 Three Point Revolution featurettes will also be made available via NBA.com and social media after they air on NBA TV. • NBA Inside Stuff, co-hosted by Kristen Ledlow and Grant Hill, will return with a new episode Saturday, Dec. 2, at 6:30 p.m.
• NBA TV’s The Starters, the daily 30-minute studio show that recaps the most entertaining moments from around the NBA, is co-hosted by J.E. Skeets and Tas Melas, along with Trey Kerby and Leigh Ellis. New episodes will continue Monday-Friday, regularly at 7 p.m. The Starters Twitter Show will continue with new live episodes streaming Tuesdays at 11 a.m.
• The network’s half-hour 10 Before Tip studio show will continue to offer news, notes and the latest updates for what fans need to know leading up to the night's first game. Hosted by Jared Greenberg, the show will include guests from around the league, including reporters, on-air personalities and fantasy experts, airing regularly at 6:30 p.m. on weekdays.